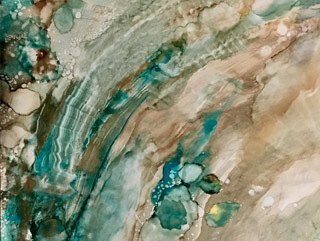 As an artist, my goal is to bring a sense of beauty and awe for nature’s simple treasures with unexpected elements. My art is a form of expression and a release of emotion. While I tried to do that through music, it wasn’t my passion. I gave up on piano lessons at the age of 12 to study in a private art studio. The piano teacher was relieved. Later, Midwestern practicality dictated a college education in business and a career in banking. 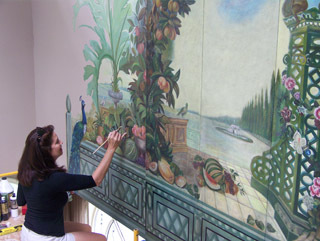 Luckily, life changes and I was able to jump into the world of murals and decorative painting 20 years ago. During that time I had numerous commissions from clients who were drawn to my style. And now, I’m drawn back to my first love of impressionist painting. 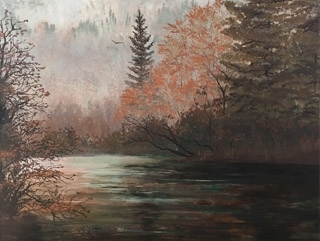 I am intensely inspired by nature, most of my paintings are some form of landscape or natural element. 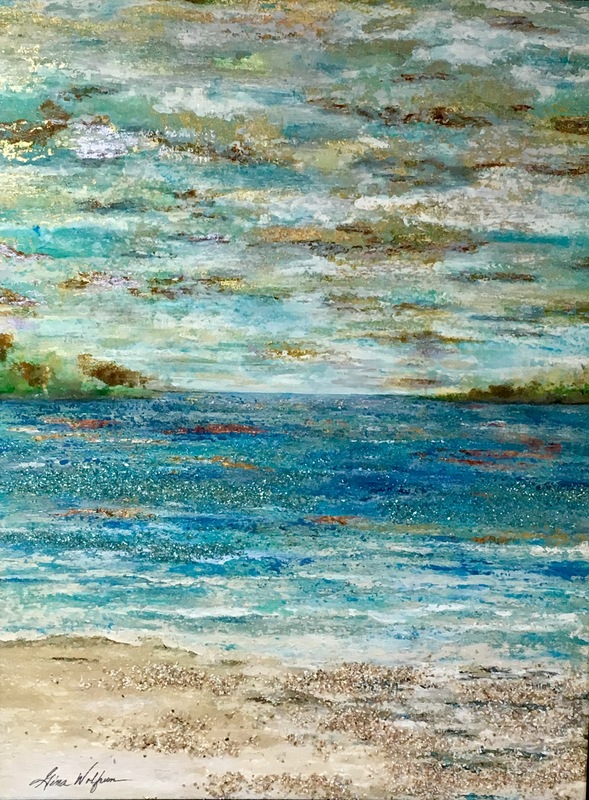 I do acrylic paintings that bring awareness of nature’s simple treasures, often by incorporating unexpected elements like crystals and glass into my paintings. My style walks the line between realism and impressionism. My work resonates a refined passion for beauty in design, resulting in art that is timeless in spirit, luxurious in appeal; a feast for the eyes and soul. The most recent exhibit at ArtPrize10 in Grand Rapids, Michigan, was well received by the public and was voted into the top 25 of the 2-D category. The entry, Amethyst Awakening, was a large, 6’x 6′ wood panel sunrise seascape that incorporated approximately 60 pounds of Brazilian amethyst crystal clusters. Dazzling, exciting and brilliant were public descriptors and yet, Amethyst Awakening, has a calming effect on the view with its thought-provoking foreground. 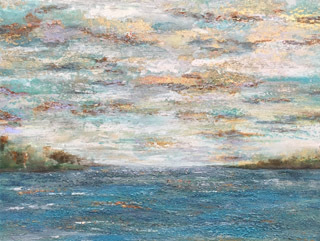 As a decorative artist and muralist for the past 20+ years, my style has developed along with my ability to manipulate color and textures for aesthetic appeal. The studio’s work has been on the cover of two trade journals, in various books and publications, and featured on local television. I have had nothing but wonderful success with Gina Wolfrum. 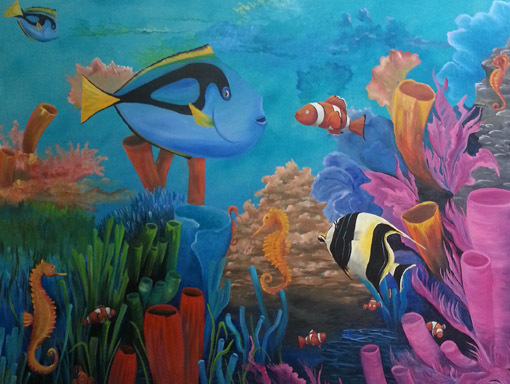 As an interior designer working with Gina for 15 years I’ve commissioned several murals, decorative wall finishes and art pieces and always been thrilled with the results! She is an extremely talented artist always improving techniques and wanting to learn more. I have always appreciated her input and ideas on any projects we’ve worked on together. She listened to my thoughts, added her own and continuously exceeded my expectations with her finished projects. I have no reservations in recommending her for any commissioned art works. I have had the privilege of owning several custom canvas creations by Gina Wolfrum. 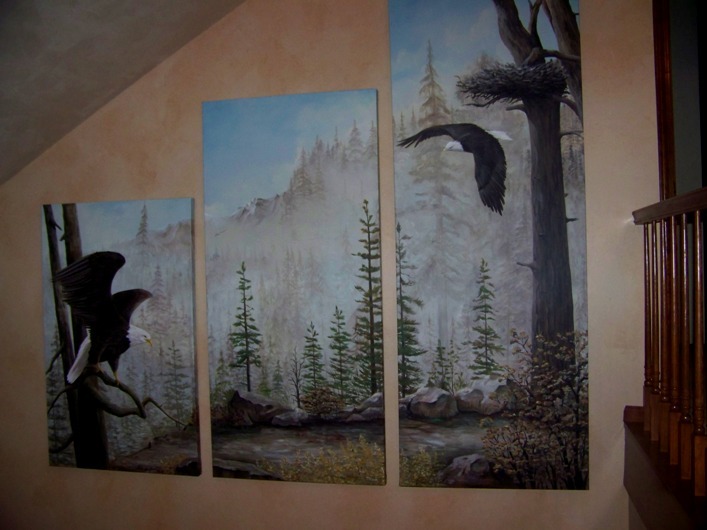 The first one is a series of three large canvas’ that create a wildlife scene. Gina was able to use some photographs we had from a special vacation to then create her own version of what we showed her. The results were FANTASTIC! These proudly graced a cathedral wall and routinely received compliments from all our guests!!! I was thrilled to tell everyone who had created the gorgeous paintings. I have original artwork that is unique and special! Perfect! Gina always adds her special touch to every piece, making it a treasured one. Gina is great about getting a sense of what her client wants and then adds her magic to the canvas. Gina Wolfrum is professional, creative,honest and a joy to work with. I have worked with Gina, for over 12 years and am currently in the creative phases of the next canvas. 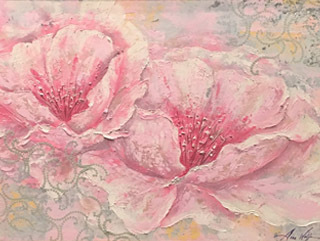 If you are fortunate enough to own a Gina Wolfrum original canvas, considered yourself blessed! 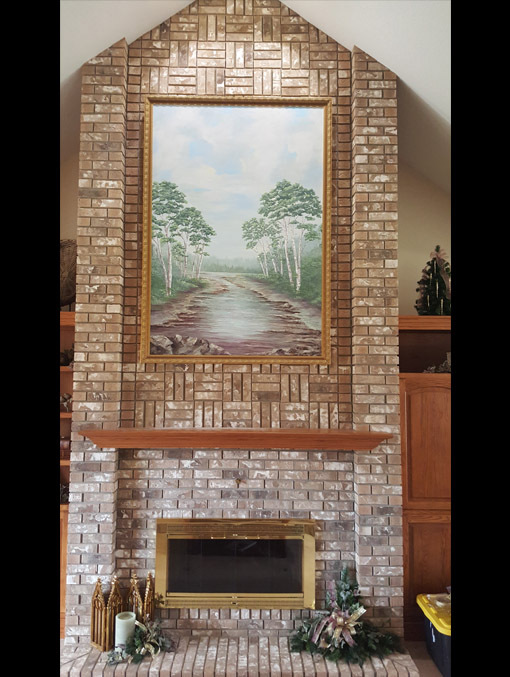 My husband and I requested Gina to create a painting for our fireplace. She graciously said, “yes” Our fireplace brick is floor to ceiling. 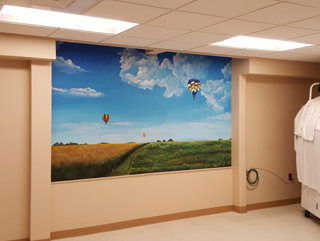 Gina listened to our wishes for the painting, offered thoughts and suggestions that were so very helpful! Needless to say, we are more than pleased! We feel that a piece of her heart, along with her wonderful artistry, is in our lovely painting! We would recommend her artwork to ANYONE! If there were star ratings, we would give her 5-stars! 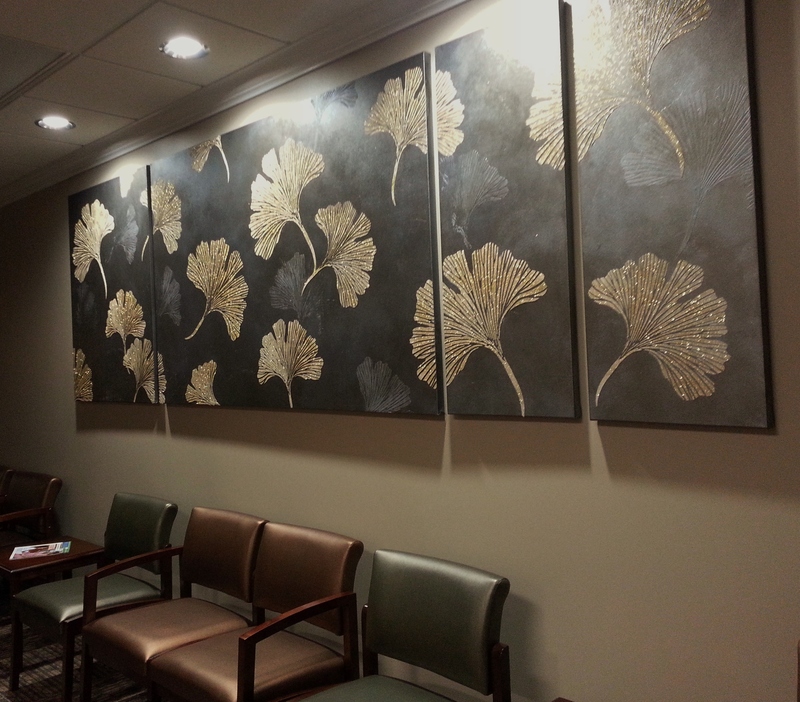 I had a wonderful experience working with Elegant Finishes by Gina. I was especially impressed with the canvas work I had done for my home. Gina took my vision to create something special for my grandchildren and brought it to life. The work is so realistic it almost pops off the wall. The children love that she personalized each one with their name. The best part about these beautiful canvases is that they can be removed from the wall if we would decide to move or if we just want an update. I would highly recommend Gina for her canvas work and I have done so to all my family and friends.